Egypt was the first country in which Srila Prabhupada set foot outside India. 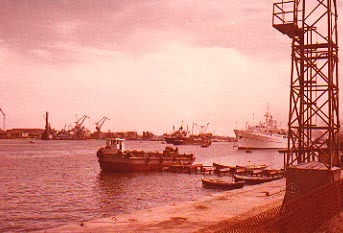 He stopped in Port Said in 1965 and visited the town with the captain of the Jaladuta steamship. Prabhupada said that he liked it. I was blessed with the opportunity to visit Port Said in 1979 as a pilgrimage to this historic city. Walking around the docks where the big freighters stop to gather supplies provided me with a rare chance to solemnly meditate on Srila Prabhupada's mission. Who could imagine the great spiritual significance of such a journey by one lone passenger on an Indian steamship bound for New York? It was the beginning of the worldwide Hare Krsna revolution.